My name is Taylor McCann. I was born and raised in Virginia. With the exception of a five year enlistment in the United States Coast Guard I have spent most of my life in the Old Dominion chasing fish and game. I have also done a fair amount of traveling with the outdoors in mind. One thing that I have discovered is that the best trips are not always when you catch the most, or the biggest, but when your goals and the outfitter’s goals are the same. I have fished with some captains that scream all day long because they are expecting a certain skill level that I didn’t have at the time. We caught tremendous trophies but it wasn’t a pleasant day. Conversely I have fished with other captains and caught outstanding stringers but they didn’t challenge me enough as an angler. My goal as a guide is to provide you with the correct environment in which you catch fish, have a good time, and learn something while doing it. It makes no difference wether you are a first timer on summer vacation or a tournament angler trying to get in some practice for an upcoming event. I can put together an enjoyable and informative day on the water. Tail Walk Guide Service, LLC is not a weekend operation. I strive to be on the water 4-7 days a week. A typical day will begin at Sturgeon Creek Marina located on Route 208 in Spotsylvania. However, if you live waterfront or are renting a summer home on the water, arrangements can be made for dockside pick up and return. If you are in need of lakefront accommodations, ask me about fishing and lodging packages. 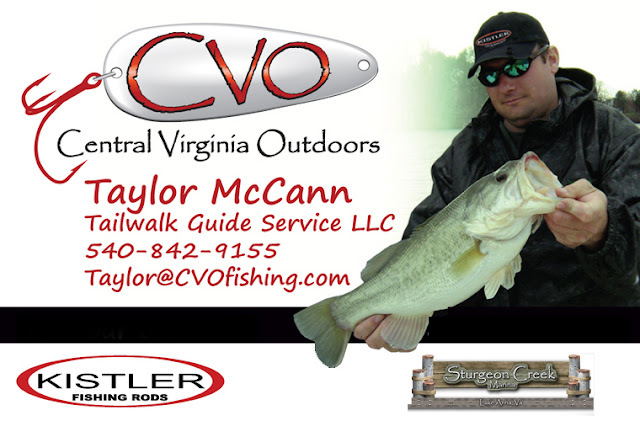 All Guide Services affiliated with Central Virginia Outdoors (CVO) have access to several furnished waterfront lodges to accommodate your needs. Families and corporate groups are welcome regardless if all persons are fishing or not. Modest rates and flexible scheduling options make for a tremendous getaway. While on a guided fishing trip all tackle and equipment is included. My boat is outfitted with Kistler Custom Rods for both spinning and casting presentations. The boat is a fish-ready 21 foot center console rigged with the most up to date electronics including GPS mapping, side imaging sonar, and a digital trolling motor with GPS guided autopilot. A large custom front casting deck (not shown in pic to right) and foot controlled trolling motor makes it ideal for bass fishing. The wide beam and cockpit provide a very comfortable platform for trolling and live bait presentations. It is powered by a 175 horse power four stroke motor that is smoke free and whisper quiet. Dual live-wells, an insulated fish box, and ample storage will ensure that you have a comfortable day on the water. With a top speed of 45 miles per hour I also have the ability to hurry back should foul weather set in. You are encouraged to bring a rain suit, sunscreen, camera, food, and drink. If you forget anything, all of these items are available lake side. Summer Happy Hour Rates (1-2 people / additional people $40 each) (May through October) Happy Hour Trips are a great way to unwind after work, watch a sunset on the water, and put a few fillets in the cooler for dinner. Please be prepared with dates you would like to fish and lots of questions. Sturgeon Creek Marina is the premier service provider in the region. Visit www.sturgeoncreekmarina.com for the latest tournament results, information on boat storage, service work, upcoming tournament information, new boat sales and much more. Stop by the marina today and fill up with ethanol free gasoline and check out the fully stocked tackle shop. Kistler Custom Fishing Rods are simply the best sticks you can get your hands on. With several different series of rods there is a Kistler to fit every budget. Not sure which taper and action you need? Kistler has a full line up of presentation specific rods taking away all the guess work. Know exactly what you want but can’t find it? Kistler has you covered! Their custom rod shop will build exactly what you are looking for. Visit www.kislterrods.com today and check out the brand new line up for 2013. If you have any questions about putting some Kistler Rods in your boat, retail opportunities, or how to get the very best price please e-mail me at taylor@cvofishing.com. Thank you for the service you providing is very nice. Virginia is a great place for fishing. Every year many of people visited there and enjoy the atmosphere. Your service is top most services. Thank you.